Whilst researching the life of G.B. Edwards for Edward Chaney’s biography Genius Friend , we discovered that before marrying Gerald’s mother, his father, Tom Edwards, had been married to Louisa Simon. Louisa, had died before 1892, but little was known about what had happened to their two surviving daughters, Kathleen and Rose, Gerald’s step-sisters. We soon found that Kathleen had married Augustus Thoumine in Guernsey, and had two children – and we were fortunate to track down her grand-daughter, Sarah Inman, who was delighted to learn of her connection to Guernsey’s great novelist. 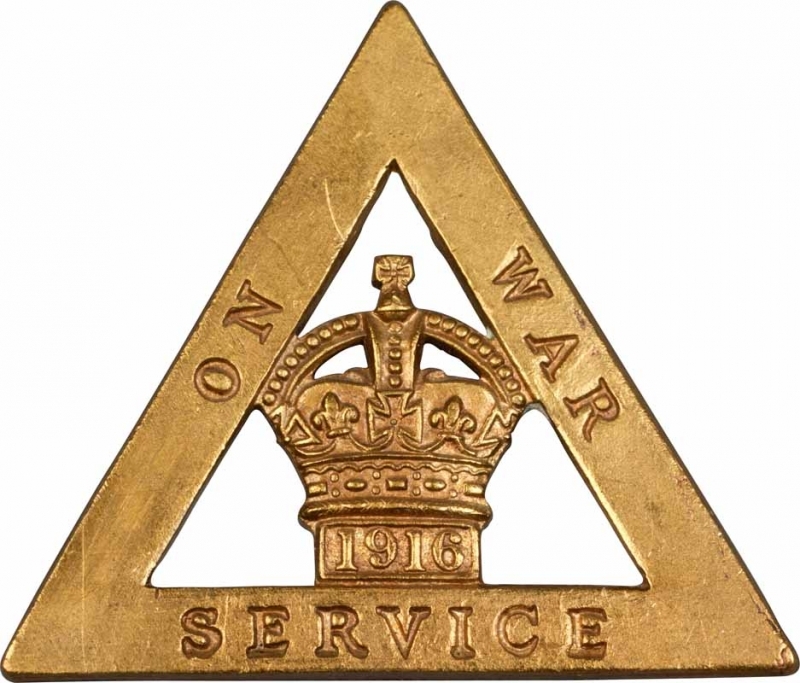 But what had happened to Rose remained a mystery until Susan Ilie (of Guernsey Ancestry) came upon an article by Liz Walton Guernsey Women in the Great War on the Channel Islands and the Great War website. This contained an account of a woman called Rose Edwards who had died whilst working as a munitionette in Woolwich. The death occurred in Woolwich on February 13, of Miss Rose Edwards, youngest daughter of Mr Thomas Edwards of ‘Hawkesbury’, Braye-road. Miss Edwards who was 31 years of age, left Guernsey two years ago for England, and took up war work a year ago at Woolwich Arsenal. One evening at the opening of this month she was passing over a bridge with some other employees, when two girls slipped, one breaking her hip and the other a leg. Miss Edwards assisted the girls till the arrival of an ambulance, but caught a chill, which caused her death. The funeral took place at Plumstead Cemetery on Saturday February 17 among those present being Mrs Gus Thoumine, of the Arcade, sister. 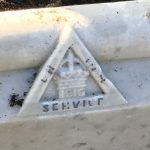 Sarah visited the cemetery to discover that poor Rose’s grave had fallen into disrepair, and arranged for its renovation. 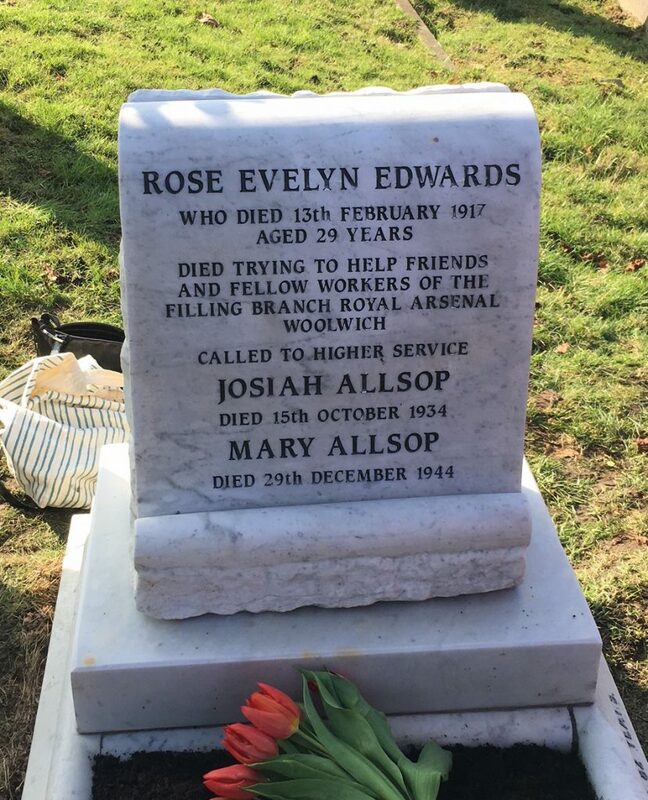 Ebenezerologist, Jane Mosse, discovered that the Allsop family also had a daughter working as a munitionette (possibly one of the girls involved in the accident referred to in the newspaper article), and they had arranged for Rose’s burial in their family plot. 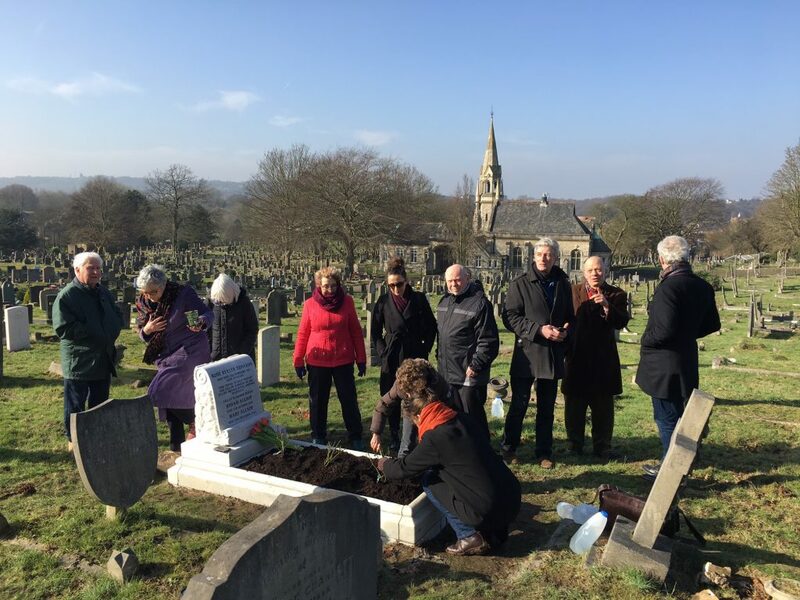 So today, precisely a century to the day after Rose’s death, Sarah’s family, descendants of the Allsop family, Edward Chaney and Steve Foote gathered in Plumstead Cemetery to mark the unveiling of the restored grave. To mark the occasion, Sarah read a passage from The Book of Ebenezer Le Page, which seemed a fitting conclusion to a century between when Rose had died alone during the dark days of World War I, and when she had been reunited with her family. 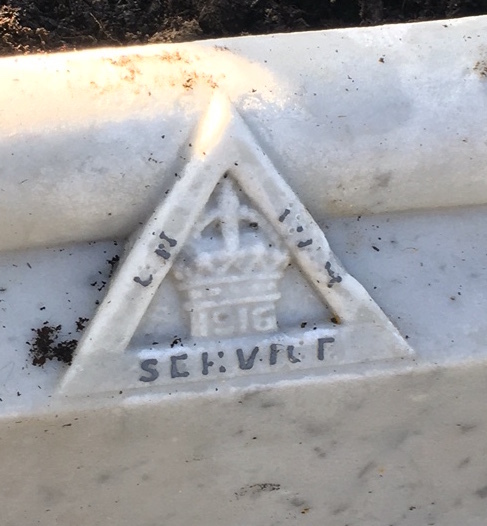 We also noticed a small emblem engraved on the front of the grave – which is an ‘On War Service Badge’ which munitionettes would have been entitled to wear to show the active role they were playing in the war effort. 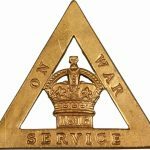 (For more details see the Imperial War Museum page ‘On War Service’ Badges).